OUR CREDIT CARD DEBT IS UNDER $20,000!!!! Sorry to shout it up there, but I can’t hold back. Payday was today and I have been itching to use the entire amount (and some) towards our debt but had to wait until after work. Then wait until after dinner. Then wait until I ran the numbers to make sure we could do it. I don’t have to wait any longer. It’s a done deal. I initiated the payments and our credit card debt is under $20,000! It now sits at $19,806. I haven’t even hit the “Publish” button on this post, yet I feel my heart fluttering a little. This milestone means a lot to me. Thank you to everyone for reading and commenting and helping to make this joyous day possible. There have been times where I’ve felt like throwing my hands up in defeat but with this blog I can’t. I can’t give up. Congrats!! You’ve come so far; it’ll be great to watch you conquer that mountain. Congrats! Our CC debt is $2 shy from being under $10,000 for the first time since, well, mid-college or so (about 9-10 years ago). I’m not counting 5k I just put on another card for tuition since that should be reimbursed by work in the next month or two, and we paid it off with some savings until then. What a great milestone in your life and a wonderful accomplishment for your family. Here’s to paying off the remainder well in advance of your target date! Next milestone… when paid off exceeds current! I’m rooting for ya! That is the greatest news! Congratulations. You’re an inspiration! Congratulations! Reaching milestones on the way to attaining your goals is a wonderful feeling! Congratulations! Not just on the milestone but on doing it with integrity too. Congrats. Good luck in the future. I was wondering if you had any non credit card debt. Any mortgage, school, car, home equity, etc loans? 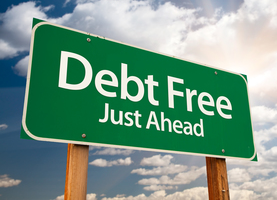 If so, how do these change your goals of paying off your debt? If not, how would they? I linked to you but never told you “in person/comment”: Congrats! We’ve been working hard on paying off our debt lately too and I really need to write it all down and see our progress each month like you do. Congratulations! That’s a big accomplishment. Congrat’s, it’ll feel really good once you get it down to 4 digits though! keep up the good work. The first thing youâ€™ll need to decide when choosing your credit card, is why you need one in the first place. Some people choose to get a credit card for cash flow purposes. With a credit card, you can make purchases and buy things, leaving your paycheck or other source of income in your bank account to draw interest. I just stumbled across this blog and have been moved to tears. I thought my husband and I were the only ones to have such high debt. I’ve felt lonely and deeply ashamed over our $43000 in credit card debt. It’s taken a year but we’re now at $31,337. It’s been even more overwhelming lately. We have 5 school age children, one of which will be a senior this year, so along with coming up with school clothes, we’ve had senior pics,class ring etc. Recently there have been unexpected medical bills and a major car repair that didn’t repair the car (but that’s another story)–all of which make it hard to focus on our debt. Your blog has been inspirational for me today– I congratulate you for getting under the $20K and more importantly, for sharing your story. This site is awesome. I applaud you for your efforts and the goals you have reached. I think this site is evident of the fact that sometimes you have to pronoun to the world (within reason) your intent in order to hold yourself accountable. Great job and very encouraging! !